By the way Roy Nelson has been boasting over Junior dos Santos, you’d think his UFC 117 adversary was the Octagon’s heavyweight champion. Although JDS is a significant 3.5-to-1 favorite to leave Oracle Arena in Oakland victorious, he knows “Big Country” is more than capable of shocking the world. 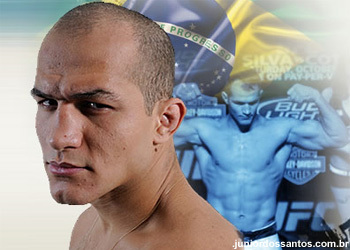 “It’s great to know that I have the respect from the other fighters,” dos Santos told UFC.com. “The respect is mutual, especially when it comes to Nelson, a crafty vet and jiu-jitsu black belt who has also shown off his knockout prowess in back to back early KOs of Brendan Schaub and Stefan Struve. While both continue to compliment each other before the curtain is drawn on their match-up, don’t think for a second dos Santos won’t immediately flip the switch back to destruction mode once the cage door slams shut. Particularly since president Dana White has promised the winner gets next dibs at the 265-pound crown. The Brazilian holds a dominant 11-1 professional record. However, what’s most impressive about dos Santos’ resume is that all of his wins have come by way of devastating finish. So you know exactly what his expectations are each time he takes the stage. Saturday’s live pay-per-view broadcast kicks off at 10PM ET/7PM PT.